Chipmunk Removal Pest Control in Toronto ON belong to the squirrel family and they have very distinctive stripes on their brown fur. On appearance, they are fuzzy, cute and fun to look at. But behind this pleasant beauty, they have the potential to damage a lot of things and destroy lots of property at home. Chipmunks mainly cause damage due to their barrowing activities. They do these around structures which if not recognized and rectified in good time, it can lead to a lot of financial expenses in restoration. They also eat seeds, fruits, and vegetables grown in the gardens. It therefore becomes important to have necessary measure in place to control or remove these creatures around your premises. We have been offering chipmunk removal services for a while now and most of our clients are satisfied with our assistance. We don’t employ the use of any technique that is illegal but everything we do is according to the requirements of the law. These include humane chipmunk removal that is not meant to hurt, injure or stress them in any way. One of the most common of such techniques is trapping whereby the chipmunk is lured into a wired box using appropriate baits. Once the rodent it trapped, it can then be disposed in a far away location where it will not manage to come back. Why work with us for chipmunk control? 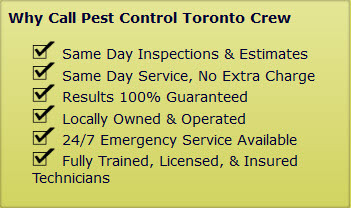 Our Pest Control Toronto Crew includes highly skilled technicians which will deal with any kind of problem revolving chipmunk removal in Toronto. We proudly service Ajax, Brampton, Burlington, Etobicoke, Maple, Markham, Milton, Mississauga, North York, Oakville, Oshawa, Pickering, Richmond Hill, Scarborough, Whitby, Woodbridge and Thornhill. Chipmunk Removal Pest Control in Toronto ON call (647) 557-7978.